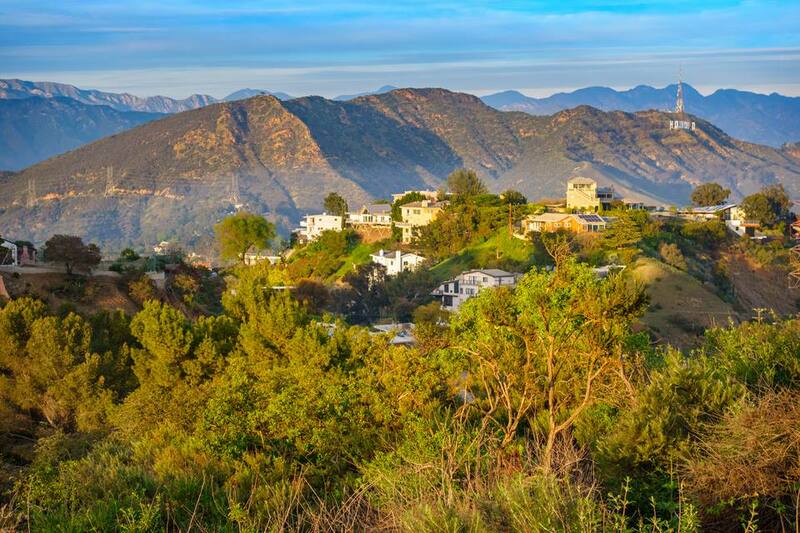 Brentwood is known as one of the wealthiest areas of Los Angeles, its population of roughly 235,000 peppered over the years with affluent professionals, political figures, and celebrities like Harrison Ford, Steve McQueen, Cindy Crawford, Gwyneth Paltrow, Marilyn Monroe, and Arnold Schwarzenegger. Brentwood is bordered by famed Mulholland Drive to the north, an area that consists largely of luxe single-family homes; Bel-Air to the east; Mandeville Canyon to the west; and Wilshire Boulevard to the south, where a mix of single-family homes and apartments are predominant in the area south of Sunset Boulevard and mainly apartments fill the area south of San Vicente Boulevard. Brentwood is also where O.J. Simpson once lived. Because of that, Brentwood received a great deal of negative attention in 1994 when all eyes turned to coverage of the Nicole Brown Simpson and Ronald Goldman murder trials. The notorious police chase of O.J. Simpson’s white Bronco ended at his Brentwood mansion. Courtroom play-by-plays regarding Brown Simpson and Goldman’s meeting referred to the Brentwood restaurant Mezzaluna (now closed) and the former’s Brentwood home at 875 S. Bundy Drive. Brentwood was once part of the Rancho San Vicente and Santa Monica land grant. In 1848, it was sold off as parcels after Mexico’s defeat in the Mexican-American War. The Brentwood area began in the late 19th century as part of the small community of Westgate, and Los Angeles annexed Brentwood in 1916. Today, Westgate Avenue remains as a reminder of this past. Many local streets are named after British regions like Barrington, Bristol, and Gorham, yet the neighborhood has no connection to Brentwood, England. In 1961, a fire, fanned by the Santa Ana winds, spread into Brentwood. Though 484 homes, fully 22 percent of the homes at that time, were destroyed, no one was killed. The fire, however, burned 16,090 acres of land and caused approximately $30 million worth of damage. Brentwood came back and is now a safe, stable community, according to LA Life, where 10 public and private schools perform well above statewide goals, where crime is 44 percent lower than the LA County average, and where the area's luxe homes sell for about $550 a square foot (94 percent of LA homes are less expensive) and pricey condos go for some $460 a square foot (92 percent of LA condos are less expensive). It is also a community of local traditions, like the annual raising of the maypole on the lawn of the Archer School for Girls, decorating San Vicente Boulevard’s precious coral trees with holiday lights every year, and the occasional Memorial Day parade. Denizens of Brentwood shop for their daily bread at the local Whole Foods or at a nearby Bristol Farms, a store so upmarket it has its own wine steward and a beautiful flower department that's been known to furnish flowers for weddings. For a meal out, residents might order from one of the restaurants at the picturesque Brentwood Country Mart (where the paparazzi camp out in search of celebrities), or they might have lunch at the Restaurant at the Getty Center, where they can enjoy sweeping views and this gorgeous campus of the Getty Museum and other programs of the Getty Trust. For relaxation, there's always golf at the beautiful Brentwood Country Club. Then it's home to one of the twentysomething enclaves inside Brentwood that read like an ode to the well-to-do, from Brentwood Country Estates and the gated Mountaingate to Brentwood Hills and Brentwood Highlands.